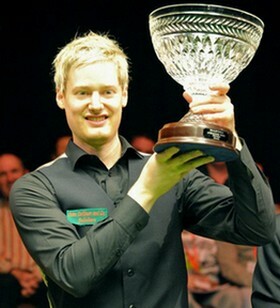 Neil Robertson continued to rewrite his own record for never lost in a ranking final - he shattered Judd Trump 4-1 in the final to claim PTC8 title (Alex Higgins International Trophy) at Killarney today. Robertson silently moved to the semi-finals after beating Martin Gould and Ben Wollaston with only throwing one frame away. 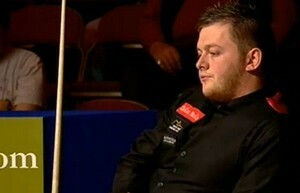 The Melbourne Machine encountered his first difficult opponent today Mark Allen. Allen cued confidently and looks unstoppable to be 2-1 up. 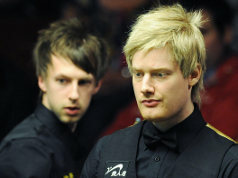 Robertson immediately adjusted his performance and ahead of Allen again 3-2 before Allen forcing a decider. Nevertheless Robertson won the decider to play Trump the final. Another finalist Judd Trump had an easy day yesterday. He smashed Stephen Lee, Alan McManus and Mark Selby before losing to Robertson in the final. Robertson proved that he was a better player than before. 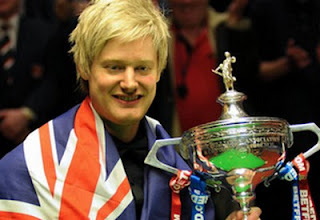 He successfully took the revenge on Trump for his first round defeat on World Championship this year. The Australian collected 10000 euro and 2000 points for the PTC title. "I've practised harder than ever this season and I am very solid, even when I'm playing badly. The player who won the world title is gone and I'm a much better player now." said Robertson. "It wasn't the best final but my safety was good and I did what I needed to,"Last season I was crashing out in the first or second round of most of the PTC events so it's great to have won a couple now. My form is looking good with the UK Championship and the Masters coming up.'' The Aussie retrieve his top spot over Ronnie O'Sullivan after his victory. Robertson has now become a more mature player than the player who won his world title half and a year ago but he keeps his long game perfectly with better safety game. It is disappointing that Mark Allen lost in another semi-finals again: this is his seventh semi-finals defeat. The 25-year-old won big matches but has not found his way to break the snag yet. Judd Trump needs to find his consistency in playing finals as well. Tragedy for Bingham losing to Selby after leading certain frames - Stuart should prevent history repeats itself.